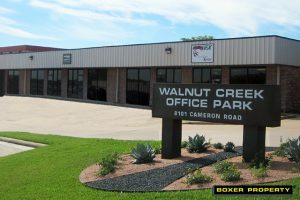 December 7, 2017 (AUSTIN, TX) – Boxer Property, a Houston-based commercial real estate firm, announced today its agreement with Roger and Parveen Mahil through their entity, MahilPR, LLC, to manage and lease office space at its property, Walnut Creek Office Park, at 8101 Cameron Road in Austin, TX. The 34,088 square foot property offers a variety of flex and office space for lease. Owning several office and retail properties in CA and NV, Walnut Creek Office Park marks MahilPR, LLC’s first TX purchase. Located in North Austin, the property features remodeled interiors, 24/7 secure key card access, roll-up doors in Building 3, and excellent visibility from the corner of Cameron Road and Rutherford Drive with easy access to major Austin highways including Highway 183, I-35, Highway 290, and 130 Toll Road. Dining and shopping choices are aplenty with options such as Costa Del Sol Restaurant, Bill Miller Bar-B-Q, Chipotle and Olive Garden all within close proximity.